Honda and Tohatsu have joined forces. The result is the Tohatsu BFT60A outboard engine – known in the marine industry as “Hondatsus”. The Tohatsu BFT60A is in fact made by Honda. The marine industry is calls these outboards "Hondatsus". There’s a new breed of outboard on the Aussie market. Known in the boating industry (henceforth) as "Hondatsus", the four-stroke outboard range from 60 to 250hp is unique – this is the first time Honda has manufactured engines for a competitor. The result is a win-win for both Honda and Tohatsu because it increases manufacturing capacity for Honda and fleshes out Tohatsu’s range with a complete line-up of carbie and direct fuel injection two-strokes, and carbie and EFI four-strokes from 2.5hp to 250hp. Tohatsu can now compete directly with the "Big Two" outboard manufacturers. The OEDA 3-star 60 is available in two models, the BFT60A and BFW60A. The BFT model has the standard 2.07:1 gear ratio and BFW a 2.33:1 ratio in the gearcase straight from the Honda BF75. This deep-ratio box is great for pushing larger planing hulls and pontoon boats, while the standard ratio is better for lightweight barra boats. Both models develop 59.1 prop shaft brake horsepower (746 watts per hp) at 5500rpm with a Wide Open Throttle range of 5000 to 6000rpm. The 998cc three-cylinder SOHC engine has the same cylinder bore as the BF75 with a shorter stroke. The camshaft timing belt is designed to last 800 to 1000 hours before needing replacing. A 17amp voltage regulated alternator is fitted to both models. Being Honda-based engines, both have features that separate them from the four-cylinder competition. One is BLAST which advances the ignition timing and enriches the air/fuel ratio to 12:1 for better holeshot performance. Then there’s ECOmo which leans out the air-fuel ratio to 18:1 midrange. Approaching WOT the air-fuel ratio goes back to around 14.7:1. This combination gives the 60 overall fuel efficiency closer to a DFI two-stroke than a four-stroke, one helluva achievement! With power trim and tilt, the standard 60 has a dry weight of 110kg, while the BFW model weighs 119kg. Powerhead access to both is excellent with the engine oil filler cap, sump dipstick and canister oil filter easily reached. The recommended oil is FCW (Four Cycle Watercooled) SAE 10W30 and valve clearance adjustment is easily done with a feeler gauge and 10mm spanner. Tohatsu distributor Lakeside Marine says to service the 60 every 100hrs or annually after the first 20hrs. The recreational warranty is three years. It was a big ask for the demo BFT60A to power the Makocraft 4.85 MX Frenzy side console tinny I’d tested both the Tohatsu TLDI 75 and 90 on in 2012, but it did a damned good job. Dave Denny, Lakeside’s fitup wiz, installed a 12in pitch Power Tech stainless steel prop that let the 60 rev right out pushing our 860kg total, including Dave and myself and test gear. The engine started instantly hot or cold and though slightly rougher than the four-cylinder four-strokes when trolling, it quickly smoothed out above fast idle. 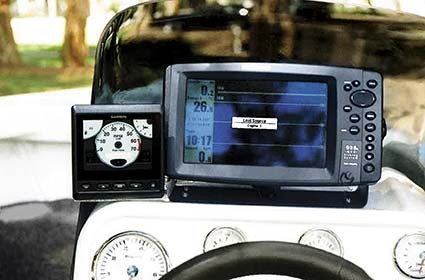 While idling out of the Budgewoi Channel (NSW Central Coast) to Lake Munmorah, I noticed how easy the Garmin instrumentation was to read – even while wearing polarising sunglasses – with its analogue tachometer and digital fuel flow in the bottom corner. When the revs went past 6000, the tacho glowed red to indicate over-revving as the limiter cuts in at 6500. Very clever. Though holeshot was not the least bit earth shattering, we still cruised effortlessly at 4000rpm and through tight turns and at 4500rpm no prop ventilation occurred. Even at WOT the 60 was quiet enough to allow us to talk normally at the helm. A smaller, lighter hull would have allowed the 60 to show its full potential, but with two aboard the Frenzy, performance was adequate. Overall the package is excellent, even with a small degree of vibration when trolling, making it very good value compared to the four-cylinder competition. As of March 2014, the remote-control model retailed for just over $11,000 with a spare Power Tech prop for around $600. Originally published in Trade-A-Boat #242, July 2014. Why not subscribe today?